People often say ‘a picture paints a thousand words’. From the expressions on the children’s faces captured in the photo above, those words would be ‘ecstatic’, ‘delighted’, ‘elated’, ‘joyous’ and 996 similar descriptors of happiness. The young attendees of the Swans’ home game against Subiaco on the 23rd of June certainly had a lot to get excited over. Despite constant drizzle the previous day and showers forecast for game day, the Swan Districts’ annual Junior Football Club Parade was rain-free. As was entry to the match for everyone aged 15 years and under and for every parent who accompanied a junior footballer dressed in their club colours. The children had a lot of fun trying out all the free games and activities in the Swans Play Zone and were thrilled when players from the league team stopped by to sign posters, give away footballs and have a quick kick with them. After working up an appetite on the bouncy castles, riding the bucking bull and playing laser tag, all the junior club members received a free soft drink and enjoyed the complimentary sausage sizzle provided by community partner, Atwork Australia. 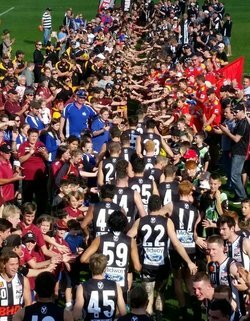 Re-energised by the lunch, 600 boys and girls swarmed onto the field to participate in the parade - a phenomenal figure that highlights how important Swan District’s continued support is to youth football. Twenty junior football clubs located within the Swans community were represented in the parade. Each club was introduced and warmly received by the crowd as their members marched proudly around the oval with huge grins on their faces. The parade concluded with the juniors forming a guard of honour for the Swans’ players to pass through, to face league leader Subiaco, on their home turf. “What a beautiful day for the Junior Parade Day at Blue Steel Oval … the children were extremely excited to walk around the oval,” Guildford Junior Football Club posted on their Facebook page. “We had a great day, so proud to see our club parade,” a club member’s mother added. Participants said being in the parade made them feel special, boosted their confidence and helped increase their self-esteem. They felt proud to represent their club as well as self-pride and looked forward to possibly playing for the Swans one day. Hosting the annual junior football club parade has been a long-standing tradition at Swan Districts and is one of the many ways the club encourages and nurtures the next generation of professional athletes. Another is the work the Swans’ Development Officers and Football Ambassadors do in local schools and junior clubs to promote greater participation in football. ‘We run a number of in-school programs in the Swan’s district to get children interested in football from a young age such as The Eagles Schoolboys Cup, an inter-school competition for boys in Years 8 & 9 and Auskick which is offered both as an in-school and after-school program for pre-primary to year 2 students,” said Christian Tufilli, Swans District Development Officer. “We also have a coaching and umpiring program for secondary school students”. “What I enjoy most about running these programs is giving the kids a taste of what football in school and seeing them transition into club football where their potential can be recognised and developed, Tufilli said. The programs aren’t just about introducing them to Australian Rules football. The children are also educated in the basic principles of health, fitness and nutrition. Through the course of the programs, they gain invaluable mental and psychological skills such as self-motivation, self-responsibility, persistence and resilience, and learn the importance of maintaining a positive attitude and outlook. 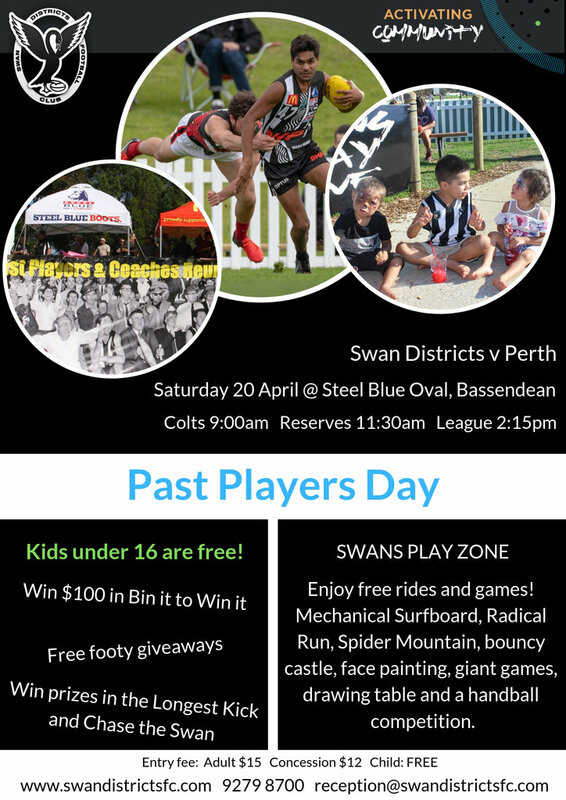 Coupled with the physical aspect of playing footy, which develops their motor and social skills, the Swans are laying the foundation for a healthy lifestyle that will carry the children through their teenage years and better prepare them for adulthood. Self-doubt, low confidence and lack of support can rain on any child’s parade, steering them away from setting and achieving their goals. This is what the club attempts to negate from a young age, striving to remove the barriers that could potentially prevent young people from fulfilling their dreams. 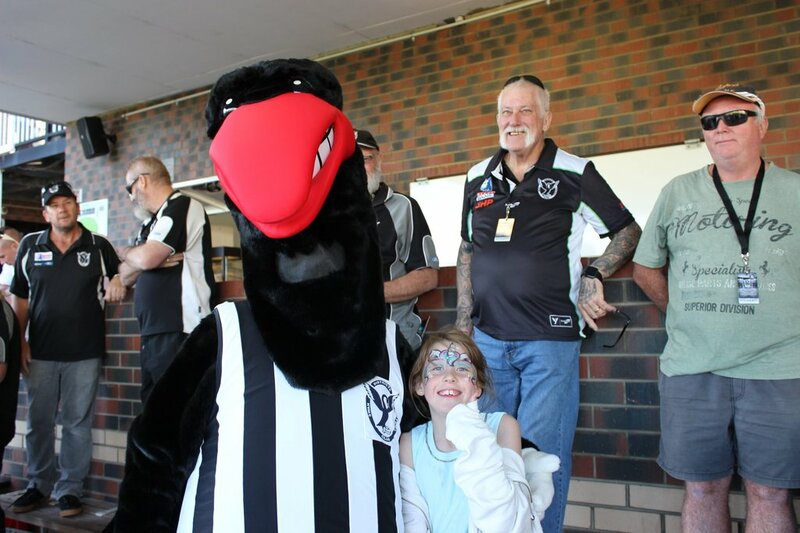 Celebrating the junior footballers each year with a parade fosters a sense of belonging – to their club, to the Swan Districts and to the community as a whole. The response it generates from the participants, their parents, junior football club staff and parade spectators indicates the club success in meeting its objectives of building community cohesion and connection, and providing a positive, healthy, caring environment that empowers members of the Swan community to be the best they can be.